If you are looking for a Beach hotel in Hua Hin complete with swimming pool, then look no further and book your stay at Novotel Hua Hin Cha Am Beach Resort & Spa, the best choice to relax during your holiday. Summer season is coming! 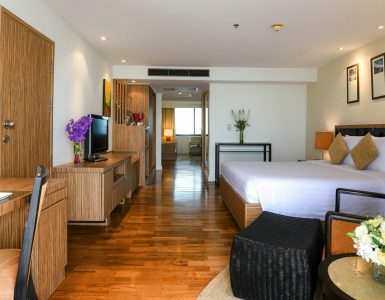 Book now at the Beach hotel in Hua Hin complete with swimming pool for an even better experience. Located right next to the sea, you can take a relaxing walk along the beautiful beach while listening to the waves crashing up onto the shore. Here at Novotel Hua Hin Cha Am Beach Resort & Spa, we pride ourselves as being one of the best Beach hotels in Hua Hin which is complete with a large outdoor swimming pool right next to the sea. Additionally, we also have a child’s pool area to keep your children safe. Want some fun? Enjoy our waterslide which is suitable for both adults and children. If you feel the need to exercise, our pool accommodates guests to work out with ample space for lengths. 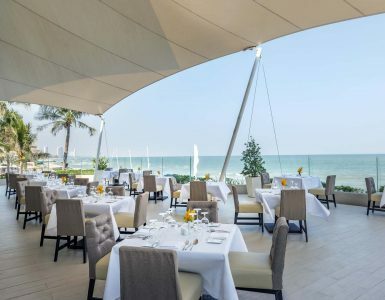 Additionally, Novotel’s Beach hotel in Hua Hin also has a pool bar so guests can enjoy a selection of drinks and snacks before, during and after their swim. Novotel also offer a happy hour promotion of ‘buy one get one free’ between 16:00-17: 00 pm every day. Selfie for social media? With beautiful views and location, it is the ideal setting for that perfect holiday photo. We hope you enjoy our spacious swimming pool with views of the sea and tropical garden while staying at Novotel Hua Hin Cha Am Beach Resort & Spa and are sure you will love every moment.